Special Envoy to Middle East and Organization of the Islamic Conference. Alwi Shihab is one of the leading authorities and scholars on the interaction of Christian and Muslim communities. In 90’s he wrote a book about Islam-Christianity interaction: Islam Inklusif .He has recently completed two works for publication: a manuscript entitled American Students’ Perceptions of Islam, and a translated (from Arabic to English) version of a previous publication entitled Islamic Mysticism and Its Impact on Indonesian Society. 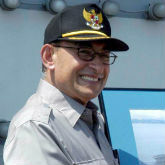 His political career started when he was elected as member of Indonesian parliament and then minister of foreign affairs in The Wahid administration. Alwi was The chairman of PKB (The National Awakening Party). He served as Coordinating Minister for People’s Welfare and a minister in Susilo Bambang Yudhoyono’s cabinet. On October 26, 2004 He was honorably discharged from PKB due to the party’s internal political conflict and clash with some other leaders. In 2007 he founded his own party, Partai Kebangkitan Nasional Ulama (PKNU) or “Party of National Scholar Awakening” in which he still serves as the chairman until now.